By automating and optimizing the ‘Last Mile,’ organizations can introduce an agile and scalable process to provide enterprise-wide visibility, greater accuracy of data and significantly shortened cycle times. 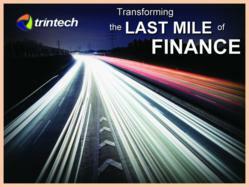 Trintech, the leading global provider of integrated software solutions for the Last Mile of Finance, announced today that it will be a major sponsor and Track Chair for the Finance Transformation Track at the North American Shared Services Week in Orlando, FL March 7th-9th. Trintech’s Margaret Kelly will present with KPMG and Dr. Pepper-Snapple, a session titled “The Last Mile of Finance Optimized” which will focus upon best practices for Shared Services Centers surrounding “Last Mile” activities. The Last Mile of Finance is traditionally a loosely coupled set of activities which take an organization from the transactional processes at entity/ business unit level to a consolidated set of financial statements accompanied with detailed information reflecting the financial performance of the organization. Shared Service Centers have an opportunity to transform the “Last Mile” process into a strategic and seamless record to report process utilizing focused process enabling technologies. The North American Shared Services and Outsourcing Week conference will provide the most visionary thinking on shared services with a focus on priority business outcomes. Presentations will detail how shared services will continue to add value in this downturn economy and highlight the opportunities for those evaluating, optimizing and re-engineering shared services. The multiple tracks taking place at Shared Services Week (Planning & Launching, Globalized and Multi-Functional, HR Transformation, Measurement & Process Excellence, Talent Management, Blue Sky, Finance Transformation, Leveraging Technology and Mid-Market) have been developed to cater to the specific needs of various functions and stages of adoption. Date/Time: Thursday March 8th 1:50 pm.